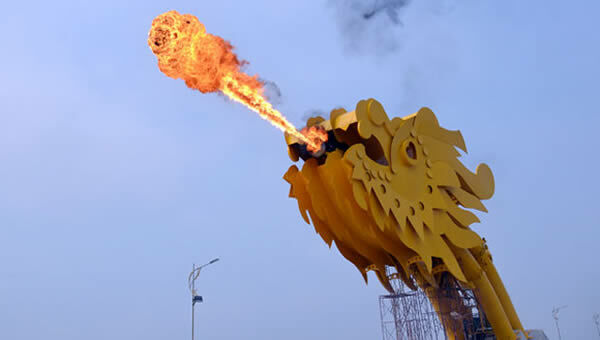 This bridge in Vietnam is one of its kind – it breathes fire! 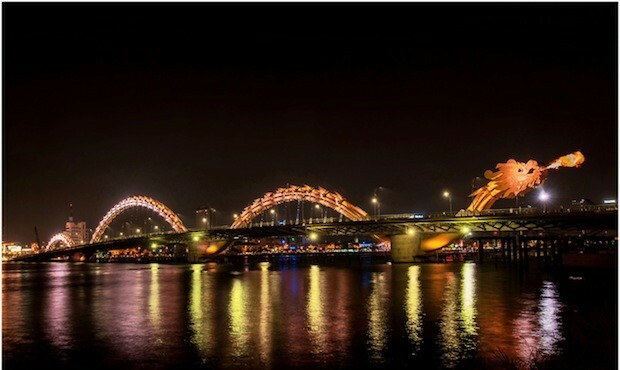 The Dragon Bridge is located in the Vietnamese city of Da Nagon and has as the name suggests is modelled on a dragon, a traditional Vietnamese symbol of good luck. It opened in March 2013 At night, the bridge, illuminated by more than 2,500 LED lights performs regular fire breathing displays. The head can actauly shoot out fire and water. The Dragon Bridge, which has to be the world’s strangest bridge, cost $85 million to build and was designed by the American construction company Louis Berger Group. It connects Da Nang International Airport with the city’s downtown area. The whole bridge weighs 8,164-tonnes and extends to 666m in length with a dragon head and tail on each side. It was built to commemorate the 38th anniversary of the liberation of Da Nang, during the Vietnam War.